At its General Membership meeting held on February 9, 2002, the members of Santa Clara County Chapter #6, San Jose, California, passed by unanimous vote a Resolution entitled, "Proposed KWVA Restructure Resolution." The Resolutions Committee of the national KWVA (Ted Trousdale, chairman; Don Byers, co-chairman) referred it to the KWVA Bylaws Committee. Resolved That a resident Director, elected by the chapters within the region for a two-year term in accordance with the National KWVA bylaws (with a two-term consecutive limit), will represent the region at the Executive Council, and the resident Directors shall not hold any KWVA elective office at the State or chapter levels during their term of office." NOTE: Resident Korean War veterans are by VA estimates. The National KWVA bylaws may require amending due to the above restructuring of organization. 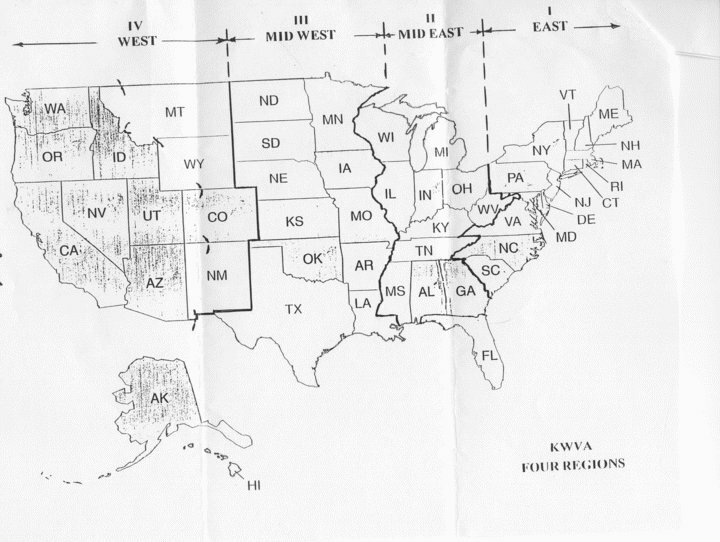 Refer to the enclosures titled: Korean War Veterans Association Regions and Four Regions State Map. 26 states east of Mississippi: 14 states in East Region plus District of Columbia and 12 states in Mid East Region (2,700,000 resident veterans); 24 states west of Mississippi: 13 states in West Region plus one territory and 11 states in Mid West Region plus two territories (1,752,000 resident veterans). 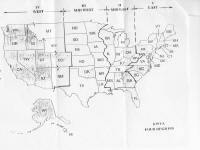 A region is a geographical grouping of states bordering one another, north and south, and territories, as identified above, for the purpose of an effective communication link with the National, sponsor National reunions within the region, promote "Tell America" programs, membership expansion and chapter information. A resident officer will officiate, as a Director, elected by the regional membership for two years in accordance with the National bylaws, will represent each region reporting to the executive Council. There will be a two term consecutive limit the Director may serve.